While the victims of the Lampedusa shipwreck were still being fished out of the water or extracted from the charred remains of the lighter that took them to within miles of the coast of Italy before going up in flames, the 155 survivors were processed by the police and put under investigation for the crime of illegal immigration. 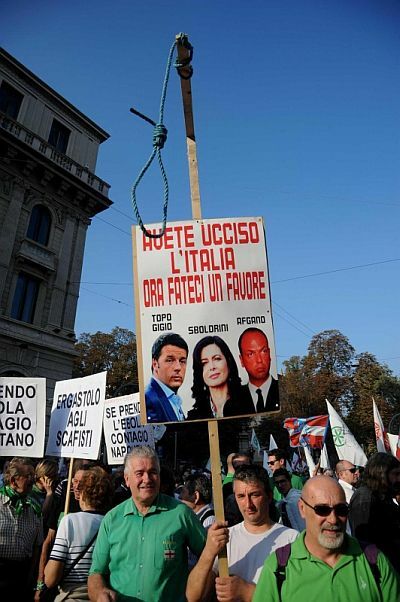 These proceedings were triggered automatically by the ‘Bossi-Fini’ Law of 2002 – the most draconian set of anti-immigration measures in Europe – and were dutifully followed even as 368 migrants lay dead. The law declared illegal immigration a crime punishable by a fine of up to 10,000 euros, and provided for Centres of Identification and Expulsion in which to detain the migrants during processing, for a period of up to six months. It also put the crews of ships that came to the aid of migrant boats at risk of criminal sanctions, in spite of an annual death toll in the thousands for those Mediterranean crossings. 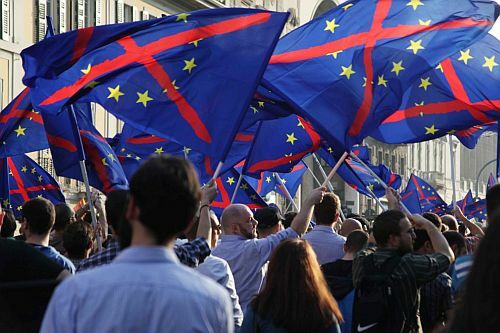 Following the massacre at Lampedusa, a softening of the public sentiment at home and mounting pressure form the European Court of Justice and other international bodies created the political conditions for a small measure of change. Illegal immigration was decriminalised in April of this year, and the period of detention inside the centres halved. At the same time, the Italian navy was put in charge of a search-and-rescue mission aimed at reducing migrant deaths. 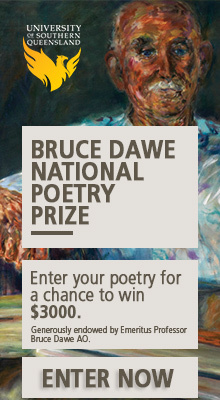 It was called ‘Mare Nostrum’ (Latin for ‘our sea’, the name that the Romans gave to the Mediterranean), and has received some praise recently in Australia. 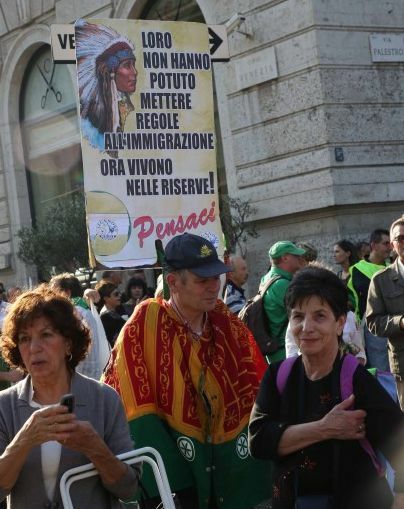 This was the background of the 50,000-strong racist march in Milan this past month ­– a year after Lampedusa – and those were the grievances: that Italian immigration laws had become marginally more humane, and that the crossings had been allowed to become slightly less dangerous. This was enough to organise the rage. The signs, the slogans, the very appearance and demeanour of the protesters were a manual of how the racist project is constructed and mobilised in what is still quaintly referred to as the first world. 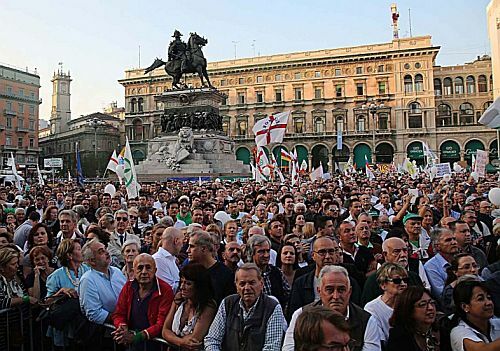 This white crowd derives its myth of primacy from the shallowest of historical sources, for the Po valley that the Padani venerate as their birthplace has always been a land of passage, cohabitation and mixing. 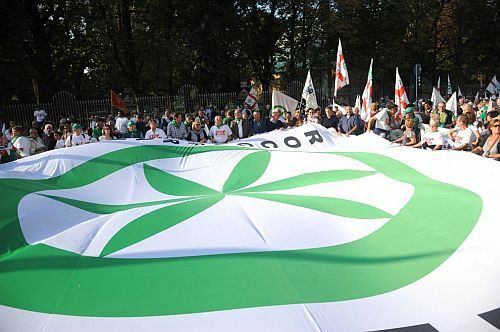 The symbols of the movement – the red cross in white background flag of the Lombard League, the stylised (and, strangely, green) ‘Sun of the Po Valley’ – have all been invented over the last three decades, along with the adoption of apocryphal 12th century warrior Alberto da Giussano as the people’s own Braveheart. Milan is the historic capital of the Italian bourgeoisie, and has long since harboured the racism of the well-off even as it drew upon – from the Italian south or overseas – the labour force ­it needed to be productive and grow. The appearance of the marchers reflect the folklore of the local racist: a narrow cross-section of the mid- to upper middle class, the embodiment of comfort and belonging. Manufactured symbols, legends and traditions were also a hallmark of Fascism and a key to its popular appeal. Speaking of which, the march was notable for the scheduled, welcome participation of neofascist organization Forza Nuova and the Casa Pound social centres. 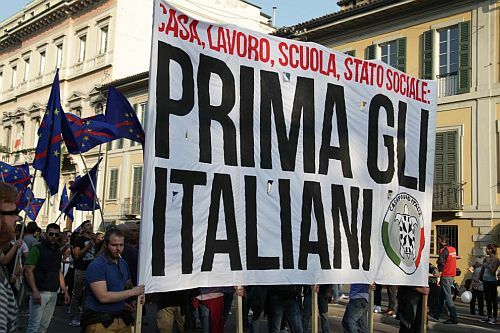 Housing, employment, welfare: ITALIANS FIRST. 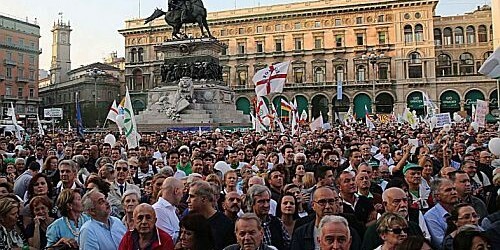 The alliance of ultra-nationalists and Northern secessionists – once uneasy and made possible only by the mediation of Silvio Berlusconi – was cemented here by the grotesque grievance over the lenient treatment of immigrants and a shared opposition to the European Union, the great technocrat seeking to impose its foreign will and rulebook. The roots of both these sentiments are to be found in an economic crisis so prolonged as to be increasingly referred to simply as ‘decline’, and for which it is preferable to find external culprits – be they the Union, the financial markets or the migrant workforce that a decimated manufacturing sector can no longer absorb. The xenophobia and racism that code all of these responses have become a shared political vocabulary with which to articulate commonality and a shared sense of belonging and purpose. We are almost privileged to watch its key phrases come together in this disciplined and photogenic march. 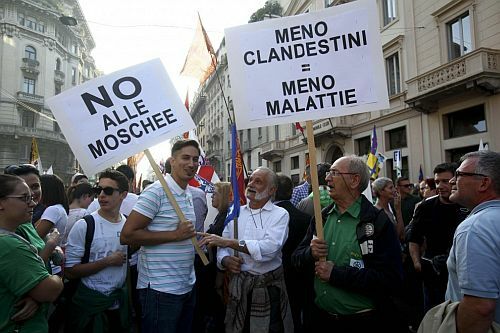 This cheerful protester is only too happy to pose with the message ‘Alfano, the Italian imam’, a reference to minister of the interior Angelino Alfano, the right-wing politician and long-time second in command of Silvio Berlusconi in charge of overseeing the Mare Nostrum mission. Remember, Mare Nostrum doesn’t result in a higher intake of economic migrants or refugees: just in fewer deaths at sea. For that matter, Alfano has signalled an end to the mission of this month, calling for the European Union to assume the overall responsibility of securing its common southern border. But this temporary appeasement is enough to expose him as a secret Muslim. And the M-word, for this crowd, is the greatest slur of all. Alongside the spiritual threat posed by the differently-religioned, the racist imaginary is equally fearful for physical health. Hence, in two of most widely printed signs at the march, ‘No to mosques’ and ‘Fewer immigrants = Less disease’. Many were the references – some worried, some cheerful – to the Ebola outbreak in West Africa. 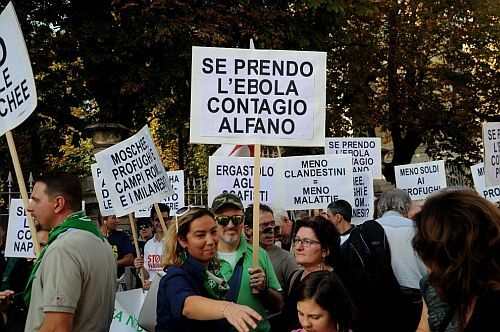 They came together in the elliptical, ‘If I catch Ebola, I’m going to infect Alfano’. Also featured above: ‘Less money to refugees’, ‘Life in prison for people smugglers’, ‘Mosques, refugees and Romani camps – but what about the Milanese people?’. The authorised slogans of a march not of the extremist fringe but of the conformist middle. Respectably mixing with Fascists. Asking for a new ‘march on Rome’. Comfortable with hanging people in effigy. Alfano is black-faced and becomes ‘Afgano’, Afghan man. Speaker of the Chamber of Deputies and former spokesperson of the United Nations High Commissioner for Refugees Laura Boldrini becomes ‘Sboldrini’, conveying a degrading sexual innuendo. ‘You have killed Italy, now do us a favour.’ This, too, is respectable. This, too, is part of the everyday vocabulary of this movement. One last image. Next to the profile of a native American chief, the sign reads: ‘They couldn’t pass laws against immigration. Now they live on reservations. Think about it.’ The bearer and his companions are dressed like tourists, or a family going on a picnic. It’s not the stereotypical picture of racism in Europe that we are used to, violent and young, marginalised. This is an older generation. They carry folding stools around for extra comfort. They see themselves as custodians of a culture, a civilisation. This racism of faux ancient symbols and neatly printed slogans is one that had to be invented. It’s the hateful response to the constant humanitarian emergency in our seas – which, even during Mare Nostrum, resulted this year in 500 migrants confirmed drowned and 1500 missing – and the slow-motion break-up of our political and economic institutions. The racism has no outlet, other than as a ready supply of votes. It has no expression, other than as a grotesque spectacle of bigotry made humdrum, a playground drone. ‘You a Muslim.’ ‘You an Afghan.’ ‘I hope you get infected with Ebola.’ Yet our politics will have to find its answers. Excellent Incisive as always, comprehensive, thoughtful, powerful. Etc. Thanks Giovanni.